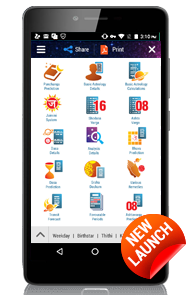 StarClock ME Pro 3.0 provides the user a choice of English + Regional language on a mobile handset. User can easily change the default language to his/her choice of language. User can set any location as default for charts and calculations. It has the facility to Add / Edit / Delete the locations and also modify the longitude, latitude, and even set time corrections like summertime, wartime, etc., if required. Application can be loaded on any android mobile phone available in the market. User can change the time in steps of minutes/hours/days/years from the Rasi view itself and the calculations are done in real time and presented on the mobile screen instantly. This helps the user to view the planetary positions, charts and calculations for different dates and times without going back to the data entry screen. User can save the birth data of individuals for future use. This facility will be extremely helpful while providing consultancy to regular customers since the user can avoid entering the birth details on each occasion and save precious time. Easy-to-navigate application for anyone familiar with mobile phones. Basic navigation keys of the mobile phone are used for navigation within the software also and hence no user training/guidance is required. While using the software, the user need not have network coverage or GPRS connectivity, since all the components of the software are installed in the handset, it can run directly from the mobile. Size of application is less than 1MB and it requires minimum memory for processing. Astro-Vision StarClock ME Mobile Astrology Software provides all the basic calculations and tables such as Rasi chart, Navamsa chart, Bhava chart, Detailed Bhava table, Astrological Day, Year, Sunrise, Sunset, Day calculations, Nakshatra, Nakshatra pada, Rasi, Lagnadipa, Rathri maanam, Kalidina Sankhya, Rahu kalam, Gulika kalam, Yamakanda kalam, Dasa periods starting and ending time, Dasa lord, Sub periods of dasa etc, Spudam, Griha Spudam, Rasi Spudam, Longitude, Nakshathra Spudam, Papa Points, Papam from Lagnam, Moon and Venus, Prashna Thri Spudam, Chathur Spudam, Pancha Spudam, Prana Spudam, Deha Spudam, Mrithyu Spudam and Sookshma Thri Spudam. You can adjust the time in minutes/hours/days/years in the Rasi view and the calculations are done in real time and presented on the mobile screen instantly. This helps you to view the planetary positions, charts and calculations for different dates and times without going back to the data entry screen. 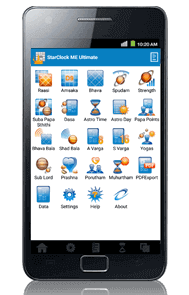 StarClock ME Mobile Astrology Software provides the user a choice of English + any one other Indian regional language (Hindi, Malayalam, Tamil, Telugu, Kannada, Oriya, etc.) on a mobile handset. You can easily change the default language to your choice. You can set any location as default for charts and calculations. StarClock ME Mobile Astrology Software has the facility to Add / Edit / Delete locations and to modify the longitude, latitude, and even set time corrections like summertime, wartime, etc., if required. 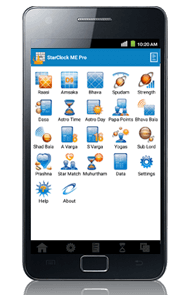 StarClock ME Mobile Astrology Software can be loaded on any Java enabled mobile handset available in the market - Nokia, Sony Ericsson, LG, Windows mobiles, etc. You can even save the birth data of individuals for future use. This facility will be extremely helpful while providing consultancy to regular customers as you can avoid entering the birth details on each occasion and save precious time. StarClock ME Mobile Astrology Software is easy-to-navigate for anyone familiar with mobile phones. Basic navigation keys of the mobile phone are used for navigation within the Mobile Horoscope software and therefore no user training/guidance is required. While using StarClock ME Mobile Astrology Software, you need not have network coverage or GPRS connectivity. Since all the components of the software are installed in the handset, it can run directly from the mobile. Android™ mobile and tablet - Requires Android™ 2.2 or Higher. A professional mobile app for Horoscope with Remedies, Available in Android mobile and tablet.